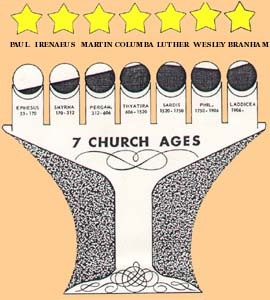 To the left is a sketch of the "drawing" of the Seven Church Ages, as drawn by Brother Branham on the blackboard while teaching a series of sermons on "The Seven Church Ages". The final message in this series was preach on January 8th. 1961. A total of fifteen Messages were delivered, showing the spiritual history of the Church. With the Bible and history, Brother Branham traces the moving of the Spirit of Christ and the anti-christ down through Seven Ages - showing the influence which each had on the Church. At the conclusion of the final Message in this series the literal Pillar of Fire (in the presence of many witnesses) appeared in the Tabernacle and drew out (on the wall) the sketch of the Seven Church Ages exactly as Brother Branham had drawn it on the blackboard. Thus, once again, God publicly vindicated His servant and prophet to this last age. I preached on the Seven Church Ages and then drew them out on the blackboard, in my Tabernacle. My Doctrine, I don't preach Doctrine out here, nothing but just the great evangelical fundamental, because I'm with brethren, might different with me, and I don't give that out before the people. Here I just try to stay on the real fundamentals of the Scripture, such as what we believe. But, at my Tabernacle, they tape It. You want It, you can have It. If your pastor don't want you to have It, don't take It. See, that's up to you. But in there, preaching on the Seven Church Ages, and to have the sanction from God, drawing them out - showing how that the darkness come into the church; Nicaea and the church angels - the messengers. It must have been right, for, as soon as I got them drawn, at the last church age, on Sunday morning at eleven o'clock, that Great Light came down into the building before almost as many people that's sitting here, come down and flickered Itself on the side of the wall before all those people, and drew those Church Ages just exactly the way I had them drawn there. Now, there's hundreds and hundreds of witnesses there to prove that. One thing is sure - this generation is without excuse. This kind of a ministry was manifested 2000 years ago in the Life and Ministry of our Lord Jesus Christ. About 4000 years ago Abraham witnessed the Same type of ministry when our Lord, in flesh appeared to him in the plains of Mamre, (Genesis 18) - just before Sodom and Gomorrah was destroyed. Now, just before this modern Sodom and Gomorrah is destroyed, God, in His Grace has sent the same kind of Ministry, with the same Signs, to the Gentile world, to take us "back to the Word".